Mother's Day is coming up! 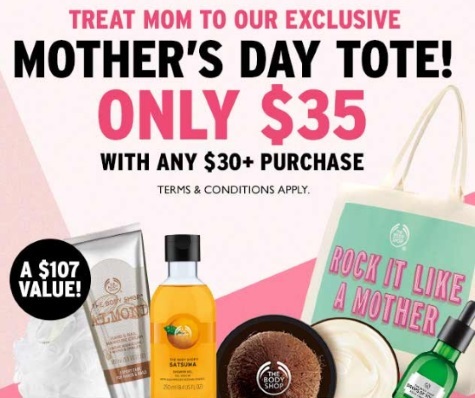 The Body Shop Mother's Day Tote promo is back! Get their cute tote filled with product favourite for $35 with any $30 purchase! Add the Mother's Day Tote Bag to your shopping bag here. Then add $30 or more worth of additional products to your shopping bag. Price of bag will be adjusted from $107 to $35. Offer is valid April 20-May 14, 2017.